Interest income declined by 5% during the six month period, amounting to $511.74 million relative to $540.44 million for the comparable period in 2017. Interest expense also declined to close at $322.43 million compared to $394.49 million in 2017. As a result, net interest income increased by 30% to $189.31 million relative to $145.95 million in 2016. As a result, Net Interest Income for the period posted a 30% improvement to $189.31 million relative to $145.95 million reported for the corresponding period in 2016. Net Interest Income for the quarter was $108.53 million, up 57.80% from $68.80 million in 2017.
Dividend Income dipped by 61% to total $5.12 million compared to the $13.04 million earned for the six months ended March 31, 2017. Gains on sale of investment also declined by 35% to $81.09 $million (2017: $124.14 million). Income from Fees & Commissions rose by 8% to close at $239.90 million (2017: $222.52 million). BIL reported Foreign exchange trading and translation losses of $25.91 million for the period, compared to $20.64 million gain recorded in the previous year. Administrative Expenses for the period amounted to $199.92million, increasing 11% from $179.45 million in 2017. Staff costs fell 2% to total $170.57 million (2017: $174.65million). Notably, BIL reported no Impairment of available-for-sale investment for the reported period (2017: $40 million). As such, total expenses for the period fell 6% to close at $370.49 million (2017: $394.10 million). Profit before Taxation, however, deteriorated by 11% to $119.61 million compared to $133.82 million the prior year. Consequently, the company reported Net Profit of $49.37 million, a 15% decrease relative to the $58.13 million booked in 2017; this followed taxation of $ 70.24million (2017: $75.7 million). 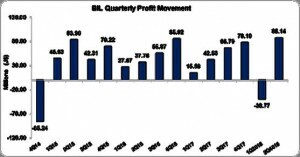 While Net Profit for the second quarter was $88.14million up 107.20% from last year’s corresponding period of $42.53 million. Earnings per Share for the second quarter ended March 31, 2018 totalled $0.20 relative to $0.10 in 2017. The EPS for the six month period amounted to $0.11, down $0.02 from $0.13 recorded for the comparable period in 2017. The trailing earnings per share amounted to $0.44, while the stock traded at $10.50 on May 8, 2018. The number of shares used in our calculations amounted to 445,001,824 units. As at March 31, 2018, total assets amounted $16.13billion (2017: $15.97 billion), an $162.89 million improvement mainly due to a growth in ‘Pledged Assets’ which increased by 21% to a total of $8.02 billion (2017: $6.62 billion). Tempering the overall growth in assets was the marketable securities which fell 38% to close at $2.60 billion (2017: $4.19 billion). Shareholders’ Equity amounted to $2.85 billion relative to $2.86 billion in 2017 resulting in a book value per share of $6.41relative to $5.15 in 2017.